Similar to rice in texture and taste, cauliflower rice can the perfect side to any dish. 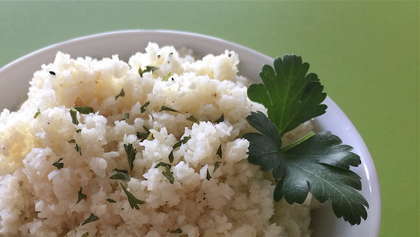 Option 1: Place a tablespoon of water in cauliflower rice and microwave on high for 7-8 minutes. Season to taste and fluff with fork. Option 2: Heat a bit of olive oil in a nonstick pan. Pan fry cauliflower rice until desired softness. Season with salt and pepper. Option 3: Add cut veggies to pan fried cauliflower rice until desired done-ness.